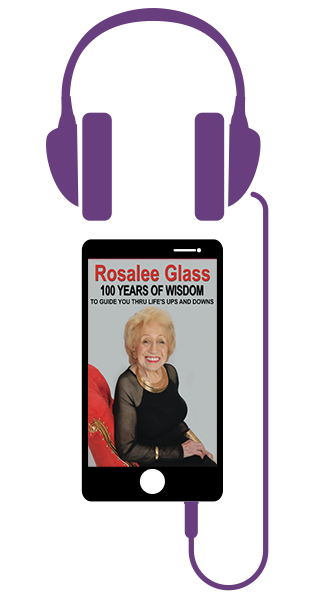 “Rosalee Glass -100 years of Wisdom to Guide You Thru Life’s Ups and Downs,” can literally enhance your life for the better. 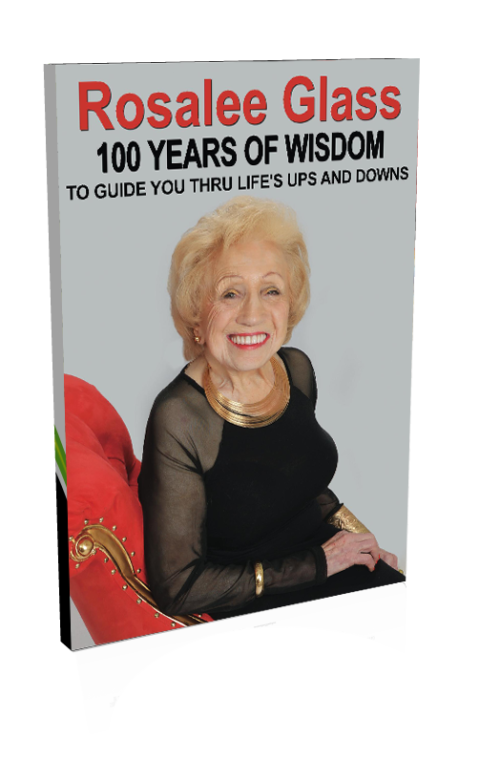 In her book, Rosalee shares with you the secrets which she learned over these past 10 decades to living a long a fruitful life and coping with major challenges, twists and turns. 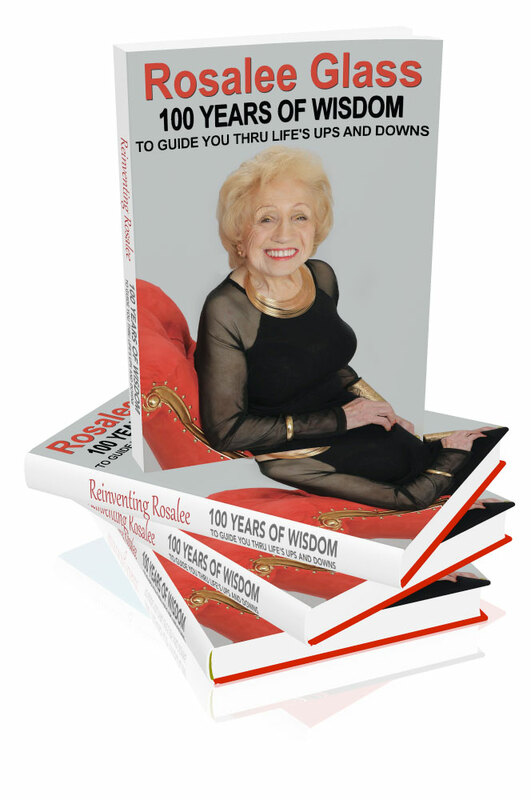 No matter how old you are, where you are from, or what you do, Rosalee’s experiences and “original” sayings will move you, motivate you, and inspire you to live your own life to the fullest as you learn the most valuable lesson- that it is never too late. This valuable gem is available in paperback, ebook, and audiobook read by Rosalee herself. Rosalee Glass was born “Rayzele Talerman” in 1917 in Warsaw Poland at Baby Jesus Hospital (Djachontka Jesus). After making a shirt for her younger brother, sister, and father at age 10, she learned she had a knack for sewing. Neighbors, impressed with her shirts, asked her to make them shirts for special occasions. At 15, she sold shirts she made to a neighborhood men’s store. At age 18, she had a successful business with 10 employees, enabling her to manufacture and sell her shirts to numerous stores in the Warsaw area. Also at 18, she met the love of her life, Abraham Glass, a very handsome violin player. Smitten by her beauty and effervescent personality, he serenaded her outside her home. A year later, with her parent’s blessings, she married him. All was well, until the couple took a stroll. For no reason, a Nazi soldier approached Rosalee and slapped her hard across the face. Shocked, both she and Abraham said and did nothing. The soldier was anxiously waiting for Abraham to fight back and defend his wife,but Abraham was too smart. As a result, the Nazi soldier let them both go. Immediately, Rosalee’s instincts told her that it was time to leave Warsaw. Even though the war had ended, no one bothered to share that with Rosalee as Russian soldiers rounded her and Abraham up and once again they were thrown into a cattle car with no idea where they were headed. They were taken off the train and left stranded in a remote place just as brutal as Siberia -Kazakhstan with no food, money, clothing, or shelter. She and Abraham were forced to live in a chicken coup. As Abraham used his skills to make leather boots which he sold on the black market, they were now able to afford food, which was also purchased on the black market. While in Kazakhstan, they had a daughter Perla whom they were able to provide nutrition. However, living conditions were so horrific that the toddler died of tuberculosis. Shortly after the baby’s death, Rosalee and Abraham were rounded up and taken to a Displaced Person’s (DP camp) camp in Feldafing, Germany. They, along with their one surviving son Manny, were granted entry into the United States. Grateful to be in a free country, and taken to what she deemed at the time as being “heaven on earth”- Miami, Florida, Rosalee added baby girl, Lily, to her small family. The “American Dream” wasn’t much of a dream as both she and Abraham struggled culturally, economically, and emotionally. They had to cope with the reality that their entire family was wiped out- slaughtered in the Holocaust. Rosalee soon faced yet another challenge – having to raise two young children on her own for several years while Abraham was taken to a sanitarium in Denver to treat his tuberculosis. After Abraham returned from Denver, his health was still poor and he went completely blind in one eye, preventing him from working in his new trade as a watchmaker. As a result, he became a house husband before it was popular, while Rosalee used her excellent sewing skills and found work as a drapery maker. After fifteen years of retirement bliss together, her beloved Abraham, who was 10 years her senior, passed away at the age of 90. Initially, it was hard for her to adapt since they were together almost every day for 60 years. But Rosalee was able to make a new life and meet new friends as she knew that was the way Abraham would have wanted it to be. Three years later, tragedy struck Rosalee in the worst way. The other love of her life- her son Manny,who had come to America with her and survived the Holocaust as well,was killed by a novice doctor of seven months, who wrongly intubated him. As a result, Manny became a vegetable and died, devastating Rosalee to the core. So depressed, she didn’t know how she would live, let alone smile again. After intense grieving, she made up her mind to take whatever life she had left by the reins and live every single day to the fullest. She decided to live out all her dreams and do things she never did before like take tai chi, dance, and acting lessons. This led to her to becoming an actress at age 82. She appeared in plays, films, and a reality show. Some of her commercials include Tiger Beer, Western Film Festival, AXE Deodorant, Porsche, Hallmark Cards, and Blue Cross (where she played a senior bride). Her most popular commercial, seen by millions who watched the Super Bowl was the award- winning “Dodge Wisdom” commercial, where she was featured saying “Hesitate…you lose” – a saying she lived by all of her life. Rosalee was also the Grand Dame” of the X Games for ESPN, and was featured in a reality show “Rolls Royce for a Day.” She even became a beauty queen, being chosen”Miss Congeniality” in the Ms. Senior California Pageant. As part of her embracing life to the fullest, she decided to travel the world and went to every corner of the globe on every continent. She found love and beauty in meeting people from all walks of life from every culture.Some of her most meaningful experiences were walking on theGreat Wall of China, going on a safari in Kenya, Africa and seeing the wonderful animals in the wild. She loved swimming in warm Lake Myvatn in Iceland while the weather outside the lake was below freezing. Attending Queen’s Day in Amsterdam was major treat. She particularly loved her experience at the Falkland Islands where a lone penguin left his flock, broke through the fencing and pursed Rosalee, perhaps thinking she may have been his long lost mother as they were both dressed in black and white. Perhaps the most meaningful experience was when Pope Benedict personally blessed her at his Coronation in the Vatican. How healing it was for this wonderful German Pope to Bless her. It had such special meaning for her in light of her family perishing as a result of the German Nazi’s. What also has special meaning for her was her return to Warsaw, Poland after over 70 years. Not only was she able to see Baby Jesus Hospital. where she was born, but she was able to pay her respects to her family at the various monuments commemorating the Holocaust and give her family members a proper burial by symbolically burying their photos and reciting prayers over them. But going to Sochi, Russia was a highlight of her life. How ironic it was to visit the summer dacha of Joseph Stalin, who was responsible for her being a prisoner of war in Siberia. How delightful and healing it was for her to eat pastry in his dining room, drink wine in his living room, play pool in his study, and even urinate in his private bathroom. Rosalee has a lot to look forward to in terms of her future . She fills each day with positive thoughts. She loves to read and learn new things. She loves to dress up in her colorful and stylish clothing which are impeccably matched from head to toe. Both her clothing and her home are in vibrant colors because she believes that colors reflect life, just as they do in nature. She exercises regularly on her stationary bike, arm pulley, and does pilates on a device that she swears by in terms of keeping her fit and healthy- her own AreoPilates reformer. She plans to do her best to promote her book which she believes will motivate a lot of people. She is also excited about filming her documentary which she also believes will not only entertain but inspire a lot of people and show them that it is never too late. She wants to continue to do things that are fun and exciting like going to Alaska, seeing the Northern lights and riding in a sled pulled by actual Iditarod racing dogs. Unlike when she was a forced laborer in Siberia, with no warm clothing, she wants to experience the below zero weather embraced by layers of warm clothing as she believes this will be a healing for her as well. She wants to go on more invigorating adventures and meeting to meet new and wonderful people. But most of all, she is very excited about her new career as an online Advice Giver. She has always said that if the war had not broken out, she would have gone to school to become a psychiatrist or a psychologist. While, she won’t be presenting herself as a psychologist or a therapist, she will be offering people of all walks of life, a service whereby they can get the personal opinion of a 100 year old experienced woman who may give them insight into their problems and issues. Rosalee lives in Los Angeles with her beloved daughter, Dr. Lillian Glass and adorable golden doddle, Annabella. put the photo you put on the back of the book here at the end of she and I and Annabella.